The year is 1817, and England is in unprecedented mourning following the death of Princess Charlotte and her still-born son. For twenty-five-year-old Lady Ariana Boxstall, the young princess’s death brings a fresh awareness of mortality and the issue of succession. Ariana’s concern is not for herself, but for her younger brother, Norris. Their father’s death two years earlier leaves only Norris between the earldom and their father’s younger brother, a mean-tempered, morally corrupt man addicted to gambling and to alcohol. Ariana pressures Norris, a Corinthian attracted to risky sports, to marry and beget an heir, the sooner the better. Norris is uninterested in marriage at such a young age, but to end his sister’s harangues, he agrees that if she weds by the year’s end, he will wed by the end of January. He believes Ariana, whose memories of her unhappy debut season are still vivid even eight years later, will not return to London where the field for husband hunters is more promising even in November than it is in Hampshire. Ariana is more determined than her brother realizes, and soon she and her mother set out for London. They begin their visit as guests of a cousin, the Dowager Countess of Cawle, a leader of society. Ariana, who is almost as tall as her six foot plus brother, is overwhelmingly aware that her height, which has earned her the title of “Hippolyta” (queen of the Amazons), is a handicap, but she is far more self-assured at twenty-five than she was at seventeen. She is confident that her dowry and bloodlines will attract candidates for her hand, and she intends to make sure the husband she chooses will march her in height. Lady Cawle understands this criterion and when she presents Ariana with a list of possible husbands, she vets them for “rank, fortune, availability for marriage, and their height.” To Ariana’s dismay, Lady Cawle’s list includes her nephew the Earl of Kynaston, who won and broke the heart of the younger Ariana. Because Kynaston too is a guest of the dowager countess, he an Ariana are thrown into each other’s company. Circumstantial evidence and a propensity to jump to conclusions lead Ariana to conclude that he is a bankrupt drunkard. She uses her erroneous ideas to argue herself out of her persistent attraction to Kynaston, who is as handsome—and as tall—as ever, and into believing that one of the others on the list will make a suitable husband. But not one of them truly suits her. Kynaston is just as eager to deny his attraction to Ariana, although his reasons for avoiding her are a closely guarded secret for much of the novel. It will take revelation and a crisis to propel this couple toward their HEA. 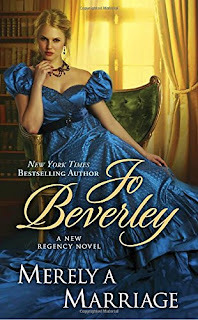 Merely a Marriage is set in Beverley’s Rogues’ world, a world Beverley introduced to her readers with An Arranged Marriage in 1991. This book is the eighteenth story set in that world, and it is Jo Beverley’s final novel. Fans of the series will be pleased to spot several connections to the Rogues and their relatives in this last book. I especially enjoyed the cameos of Hal Beaumont, Lady Cawle’s godson, and his actress wife, Blanche Hardcastle, whose story arcs through early Rogues books, and of Ariana’s friend the Viscountess Faringay, the former Lady Hermione Merryhew, from Too Dangerous for a Lady (2015) and Viscount Dauntry, the hero of The Viscount Needs a Wife (2016), whom Ariana briefly considers as a potential husband. It is perhaps not surprising that this novel, written in the final months of the author’s life, is laden with references to death. Paramount, of course, is the death of the heir to England’s throne. The death of Ariana’s beloved father and of Kynaston’s cherished young wife are significant to the plot, and the grief of both lead characters, particularly Kynaston, is intensified by the national mourning that follows the death of Princess Charlotte. It should be noted, however, that the novel ends with a wedding at Easter, the season of resurrection, and a boom of babies soon follows. Life goes on, and happiness is possible for those who survive. Ariana and Kynaston are interesting characters, but they are not always sympathetic. Some readers will be disturbed by Ariana’s single-mindedness and her reasoning, which moves past the pragmatic to coldness at times. Kynaston may seem less off-putting, but the reader’s knowledge of him is limited because Ariana is the point-of-view character. The amount of time the reader spends in Ariana’s head may make the pace of the story feel slow to some. Jo Beverley’s last book may not be her best, but its historical resonance, its thematic complexity, and the characters that linger in the reader’s memory earn the novel a place in this beloved author’s rich legacy. I will definitely be looking for this one. I will miss new books from her. I too have enjoyed her stories. I'm certainly anxious to read this. What a gorgeous cover too. I just got this one out from the library. I have read a couple books by Beverley, but in no way have I read the entire series! Thought the cover on this was pretty. First of all, I must say how sad I was to read of Beverley's death last year. We have lost a wonderful writer who kept so many of us entertained with her wonderful books. This book sounds wonderful. I'm still on my hols in England and return to the USA next week, so it will be easier then for me to keep up with your reviews.